Barcelona is reaffirming its international position as a city spearheading the impetus for sustainability policies to resolve the problems of today's energy model, by playing an active role in the more notable international initiatives on energy and climate change. The European Union’s Covenant of Mayors - Commitment to Sustainable, Local energy, signed up to in 2008, represents the main goal for mitigation: it provides for a minimum 20% reduction in greenhouse gases by 2020. The European Union’s Covenant of Mayors for adapting to Climate Change, signed up to in 2014, represents the cities’ main pledge on adapting to climate change and provides for the drafting of a specific plan. Following the United Nations’ Paris Summit on Climate Change (COP21) in 2015, a new Covenant of Mayors for Climate and Energy launched by the EU was agreed to, contributing a comprehensive vision for the first time which included mitigation, adaptation and climate justice. The Full City Council Meeting of 31 March 2017 approved the Council’s signing up to this new Covenant. A global agreement that goes beyond the European Union, involving the city’s reaffirmation of the main mitigation and adaptation pledges featured in the two Covenants of Mayors. The declaration and agreement from the Network of Cities and Towns for Sustainability in support of the Lima Declaration, signed in 2015, without any specific quantitative goals, represents a strategic position for all the members of the Network of Cities and Towns for Sustainability, including Barcelona. 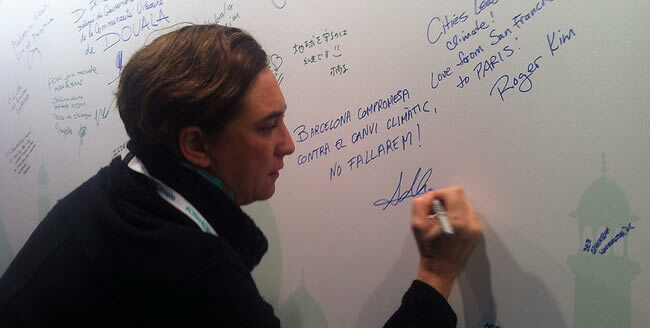 Presentation of Barcelona’s Climate Commitment at the 21st United Nations Climate Change Conference (COP21), which was held in Paris, from 30 November to 12 December 2015. The 195 countries attending pledged, among other agreements, to establish a plan whereby global warming would not rise by over 2 ºC. The next edition of the Conference, COP22, will be held in Marrakesh in November 2017. Want to know more about the Mayor’s presentation at COP21?